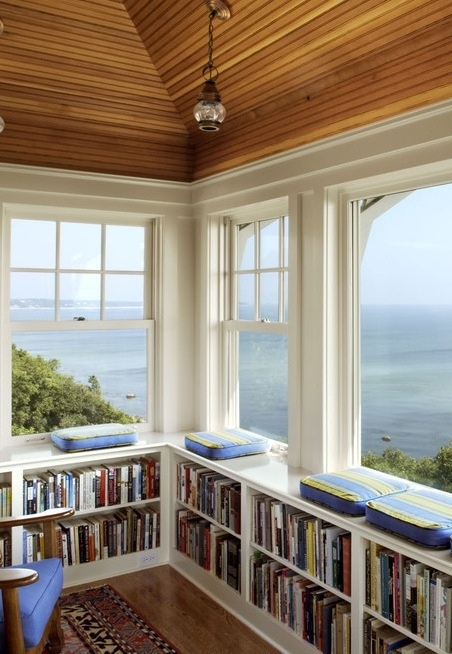 Books and ocean views? Tough combination to beat! I ABSOLUTELY LOVE IT!!! Mind you, a house as close as that to the sea in Babbacombe, Torquay (UK) has now slipped down the cliff and parts are on the beach. I trust the cliffs here are more stable! Beautiful! I live in sight of the Babbacombe house. It was sited on sandstone cliffs, very prone to erosion. The part of the cliff I live on is limestone, much harder. The house had lovely views over Lyme Bay and was worth 1.25 million pounds ten years ago. What a shame. And I LOVE the ceiling! Take my soul and me there. Ok, now THAT is amazing!! Yes, please. I’ll take one of those. My goodness, how amazing is that, Clare and I living in the same area and we ‘meet’ by looking at a house with an amazing sea view! I even love the cushions which are blue and yellow (blue for the sea, yellow for the sun?) 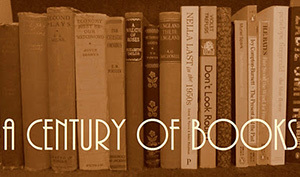 This must be the first library, Claire, that has universal approval from your readers! I reckon it would still be an amazing space on a misty day, with a sea fret rolling in – within that warm room, with a mug of hot chocolate, how atmospheric would that be! Yes Margaret, it is. I live on the Babbacombe Road near the Downs Newsagency and Caslins, the estate agents. I love it here. Especially when the sun shines, as today. That is a fabulous library! So Claire, where is this house, and what’s the body of water? I like to think it’s on Vancouver Island. Sorry Susan, I’ve tried so hard to track down where this photo was taken but I’ve not been able to come up with anything. Doesn’t really look like the Island to me, though. on February 17, 2014 at 05:56 | Reply Karen K.
That is just not fair. It’s perfect. Sigh.